Beading Arts: I need help with a name! Is anyone clever with naming pieces? 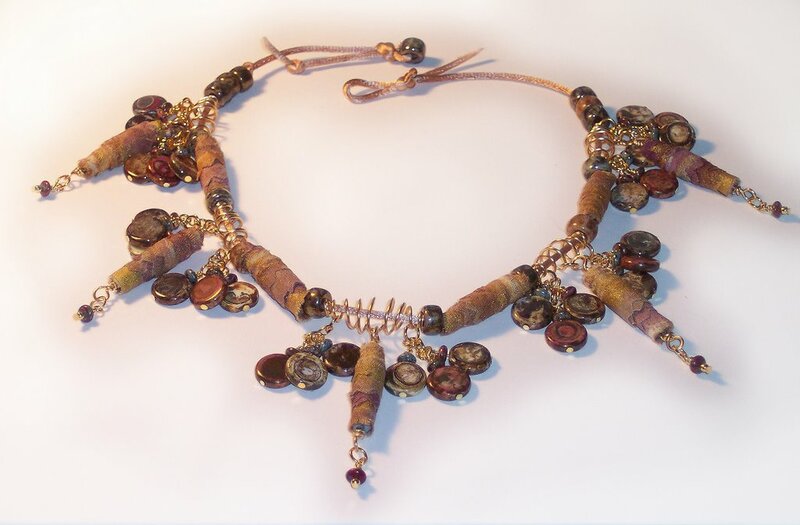 This necklace is made from muslin fabric beads, hand-dyed, ceramic beads, and wire. I'm at a total loss. Help!! I think it looks wonderfully tribal! How about Tribal Tribute? Or, Tribal Trifle? Or, Drum Beat? Ooooooo! "Drum Beat"! I *really* like that. I like "tribal" names too, but I've already used that term for a few pieces. "Drum Beat" is really fresh and new. Spiral Galaxy after the spirals in the roll-ups and the wire? OK, so now I need to make one in blue and purple and silver so that I can use that name!